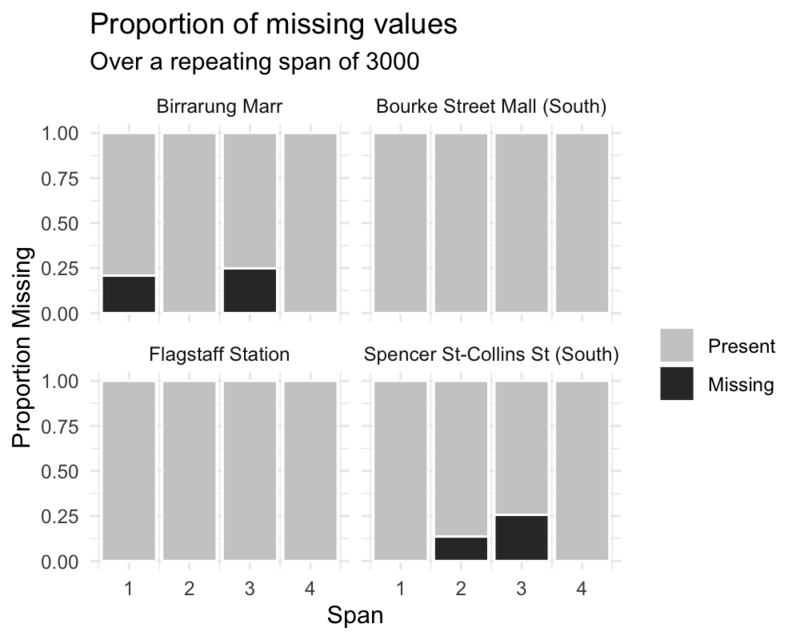 There are a variety of different plots to explore missing data available in the naniar package. 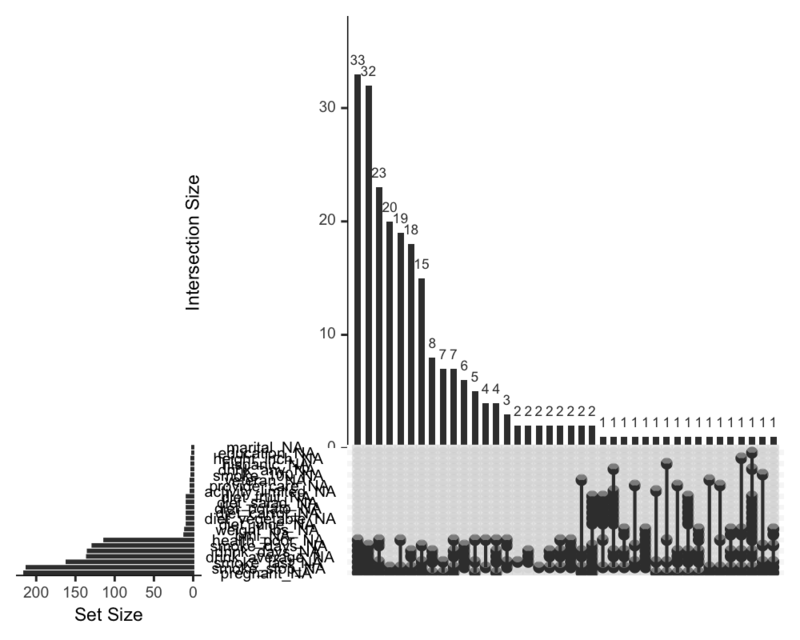 This vignette simply showcases all of the visualisations. 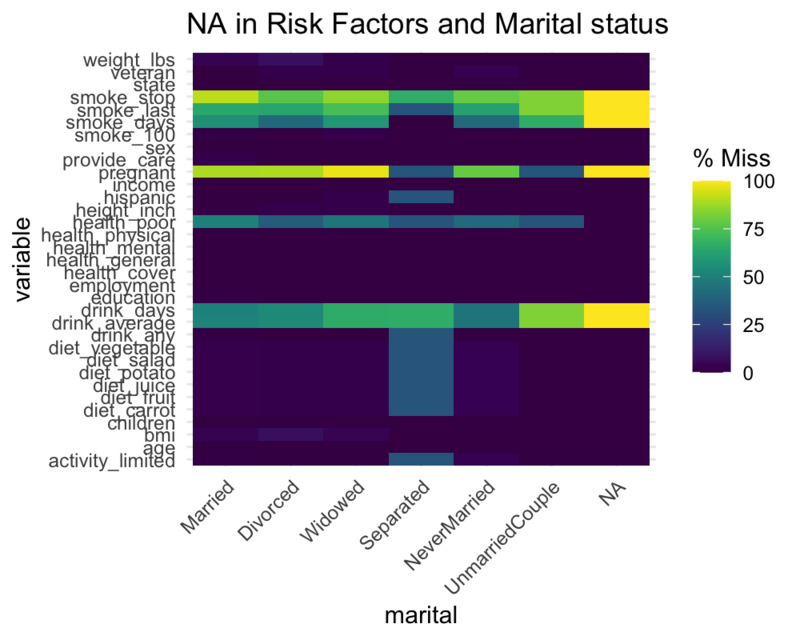 If you would like to know more about the philosophy of the naniar package, you should read the vignette Getting Started with naniar. 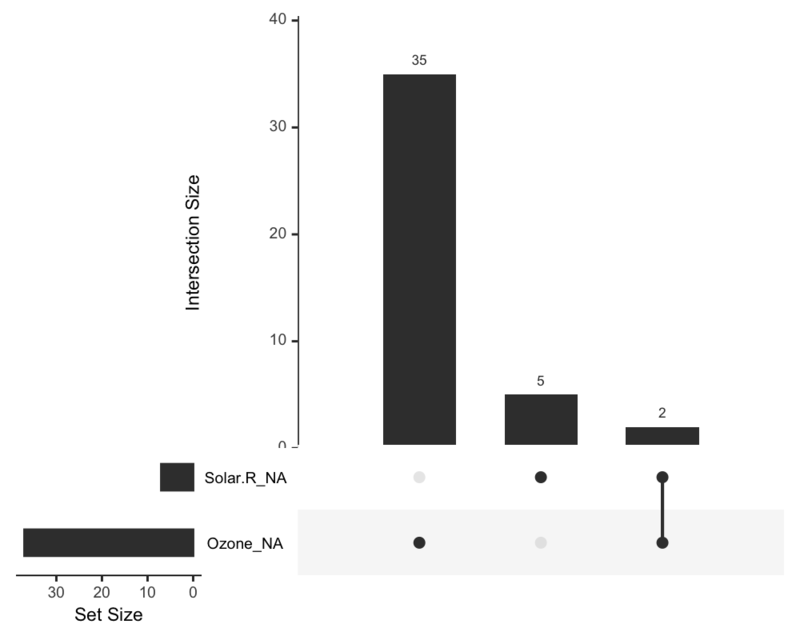 A key point to remember with the visualisation tools in naniar is that there is a way to get the data from the plot out from the visualisation. 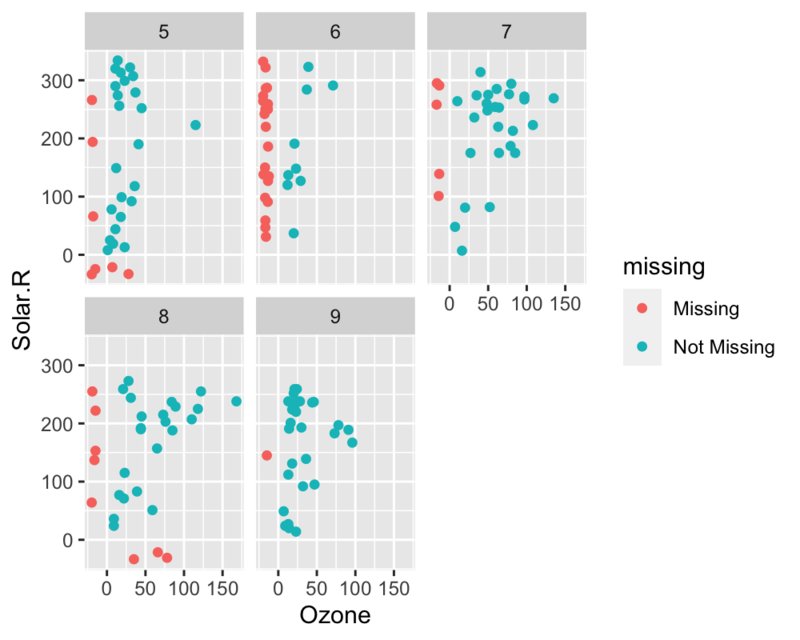 One of the first plots that I recommend you start with when you are first exploring your missing data, is the vis_miss() plot, which is re-exported from visdat. 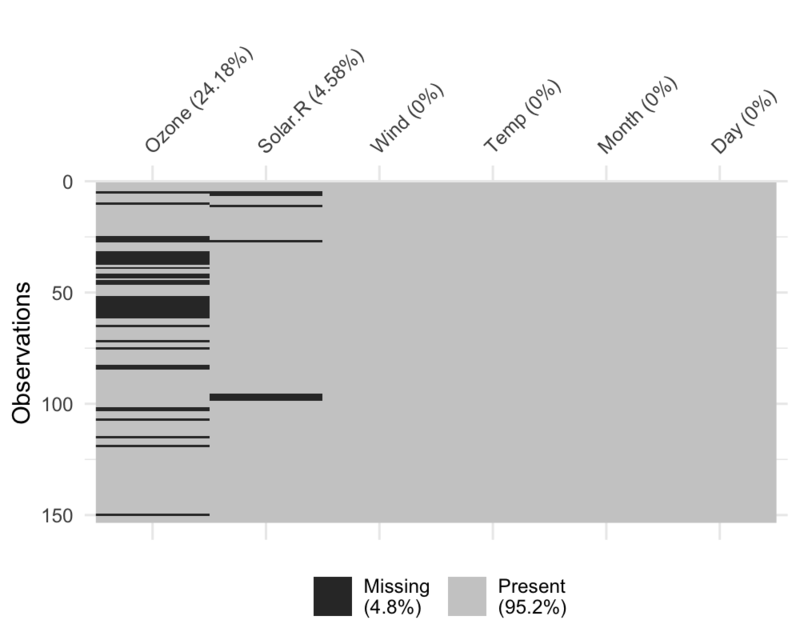 This plot provides a specific visualiation of the amount of missing data, showing in black the location of missing values, and also providing information on the overall percentage of missing values overall (in the legend), and in each variable. If there are 40 intersections, there will be up to 40 combinations of variables explored. 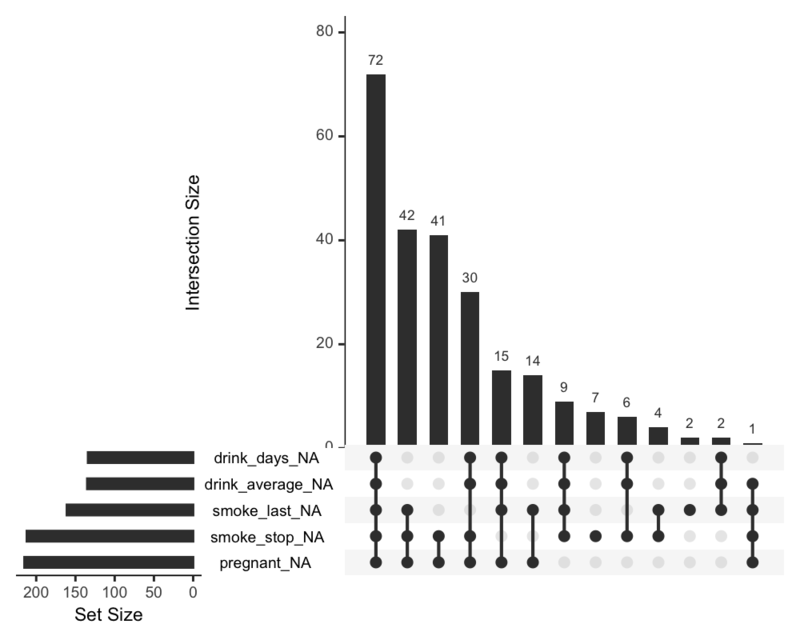 The number of sets and intersections can be changed by passing arguments nsets = 10 to look at 10 sets of variables, and nintersects = 50 to look at 50 intersections. Setting nintersects to NA it will plot all sets and all intersections. 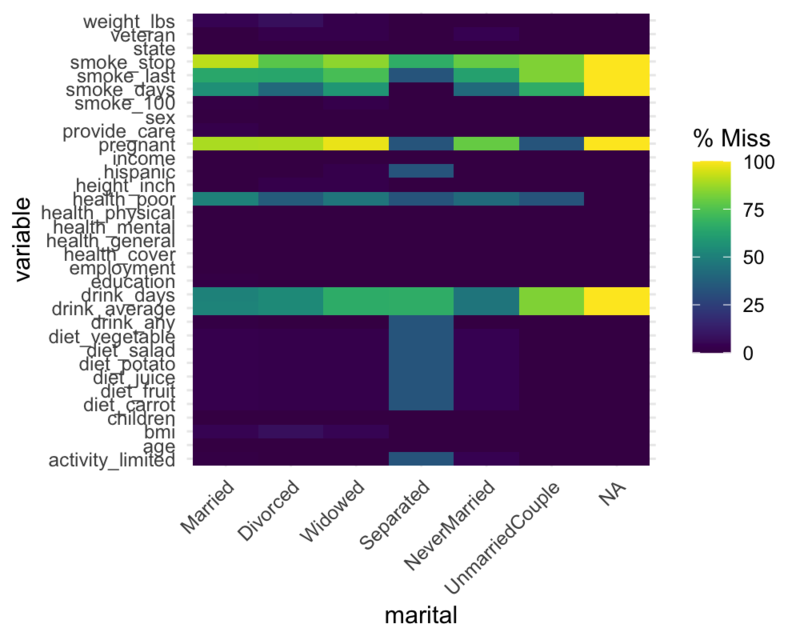 There are a few different ways to explore different missing data mechanisms and relationships. 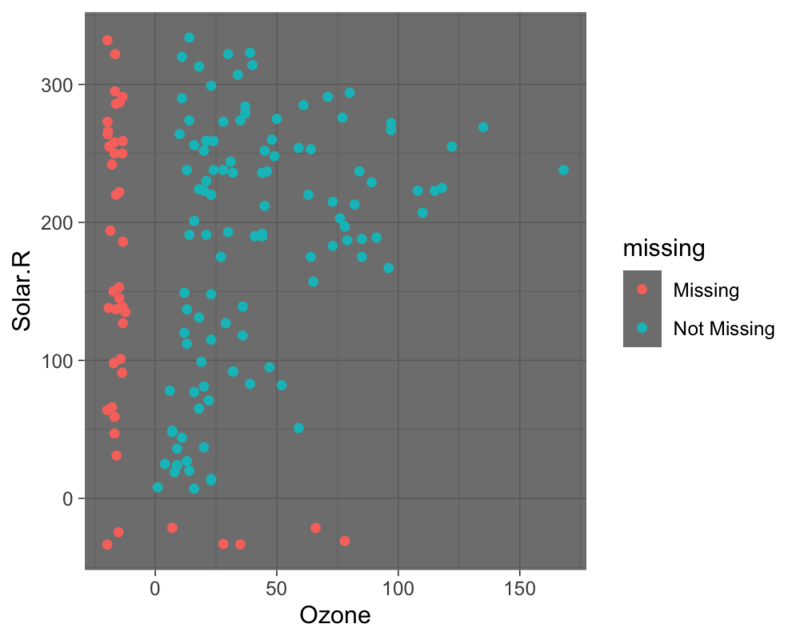 One way incorporates the method of shifting missing values so that they can be visualised on the same axes as the regular values, and then colours the missing and not missing points. 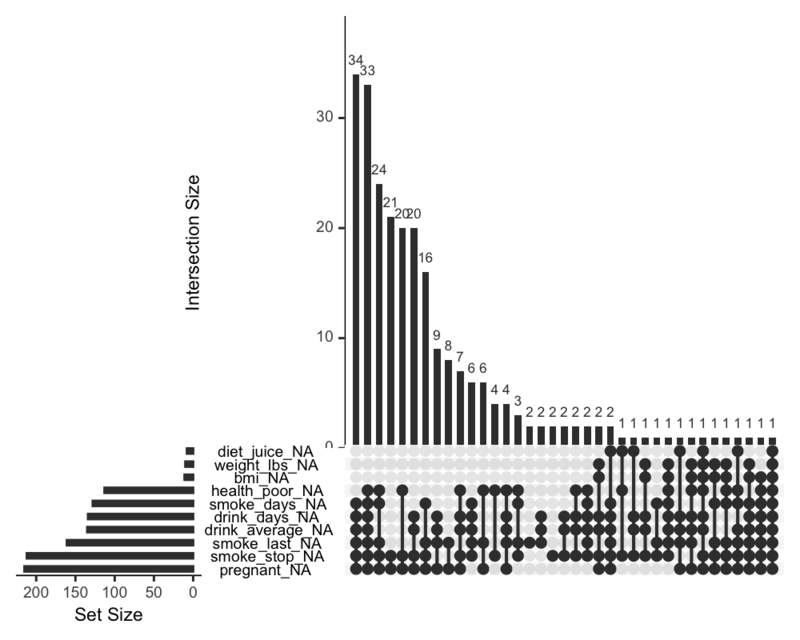 This is implemented with geom_miss_point(). 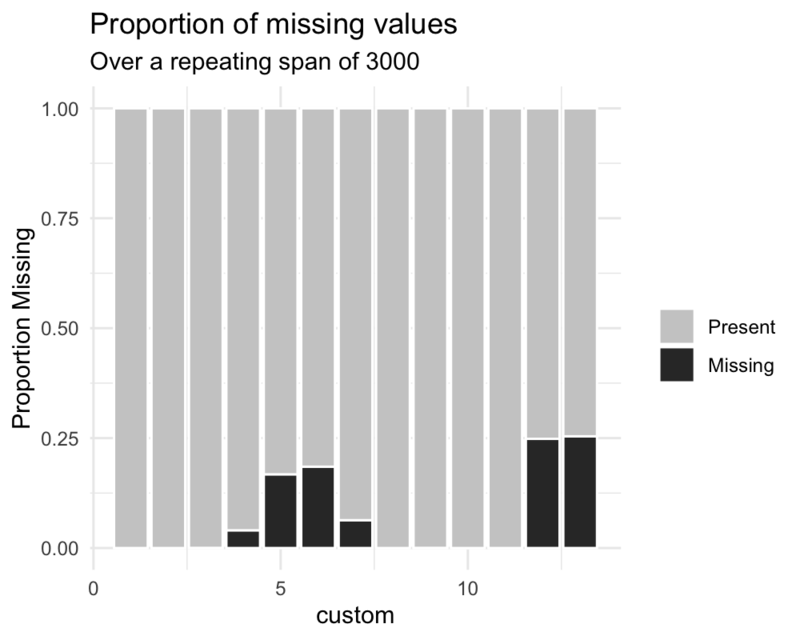 ## Warning: Removed 42 rows containing missing values (geom_point). 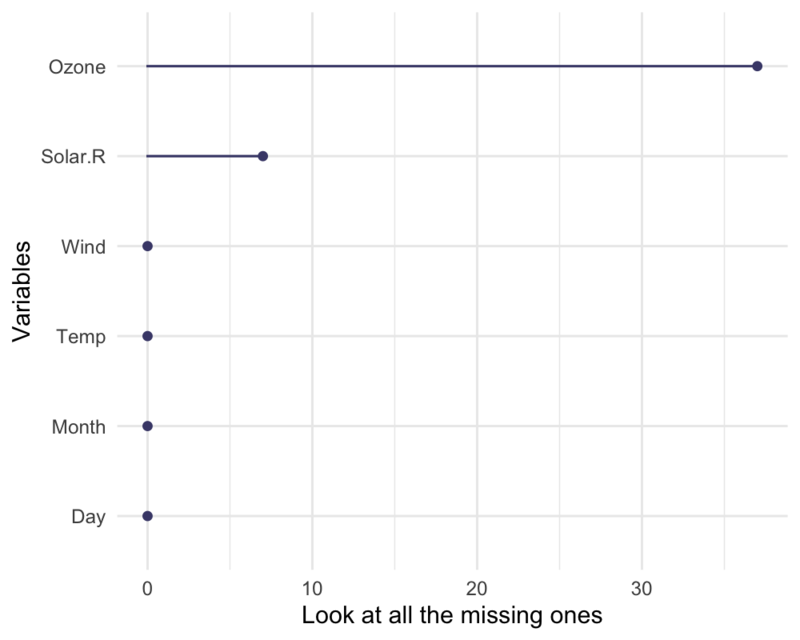 Here are some function that provide quick summaries of missingness in your data, they all start with gg_miss_ - so that they are easy to remember and tab-complete. 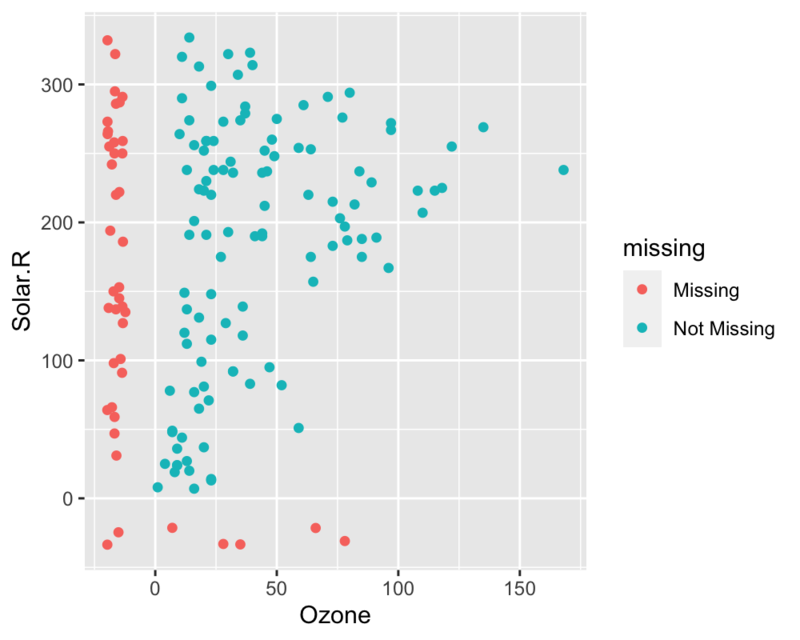 This plot shows the number of missing values in each variable in a dataset. 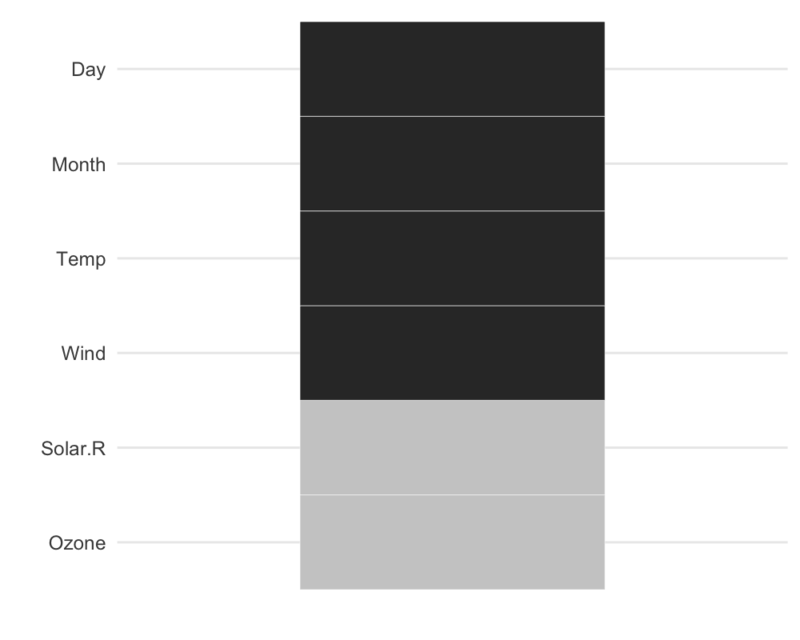 It is powered by the miss_var_summary() function. 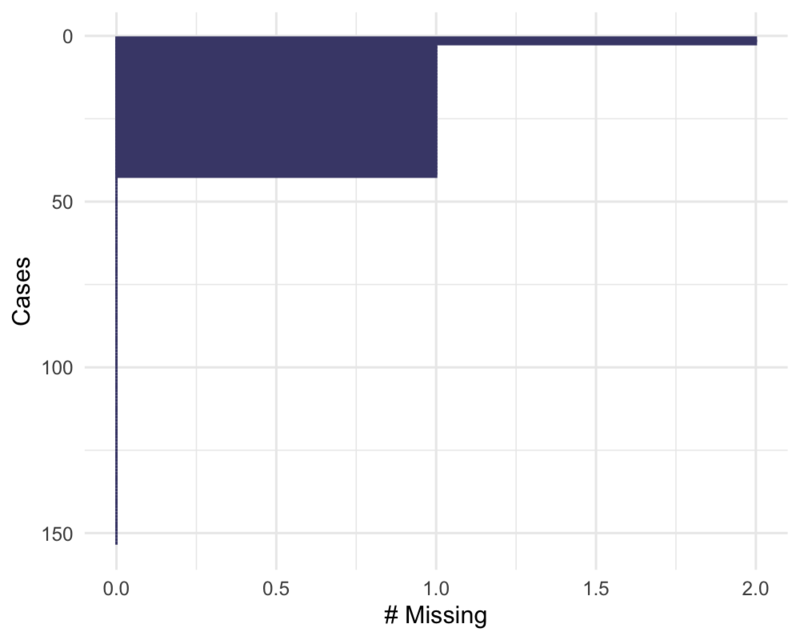 If you wish, you can also change whether to show the % of missing instead with show_pct = TRUE. 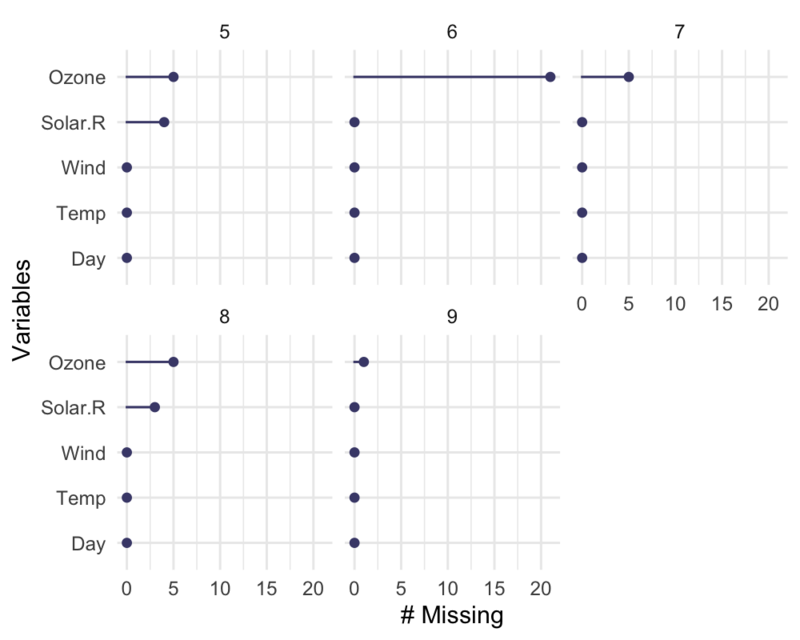 You can also plot the number of missings in a variable grouped by another variable using the facet argument. 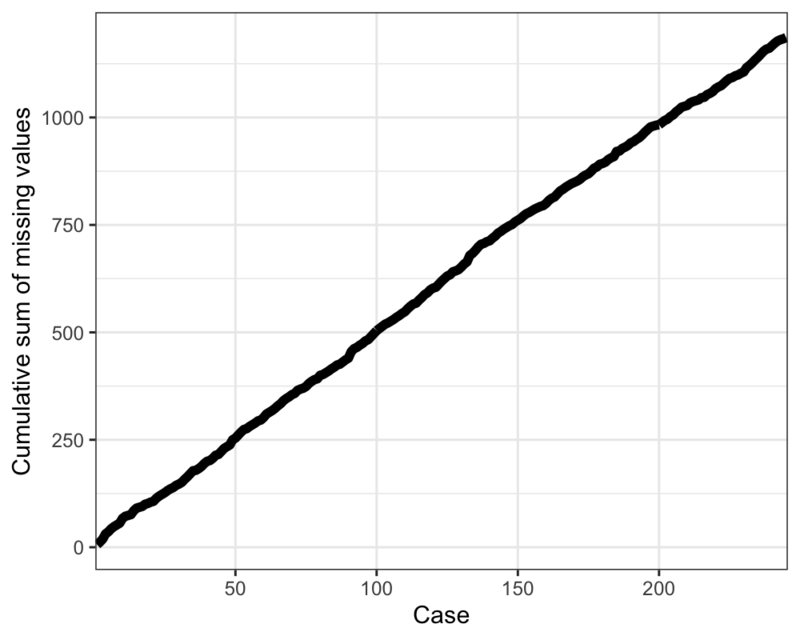 This plot shows the number of missing values in each case. 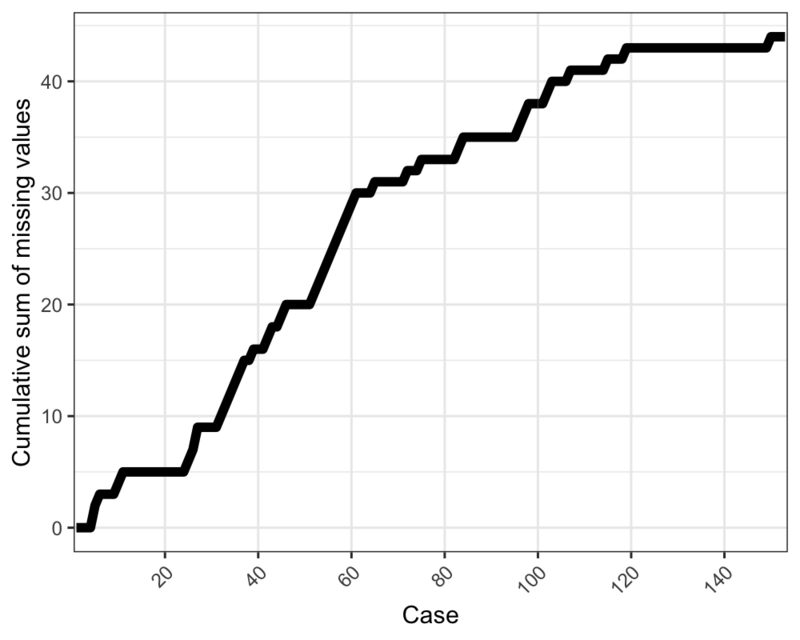 It is powered by the miss_case_summary() function. 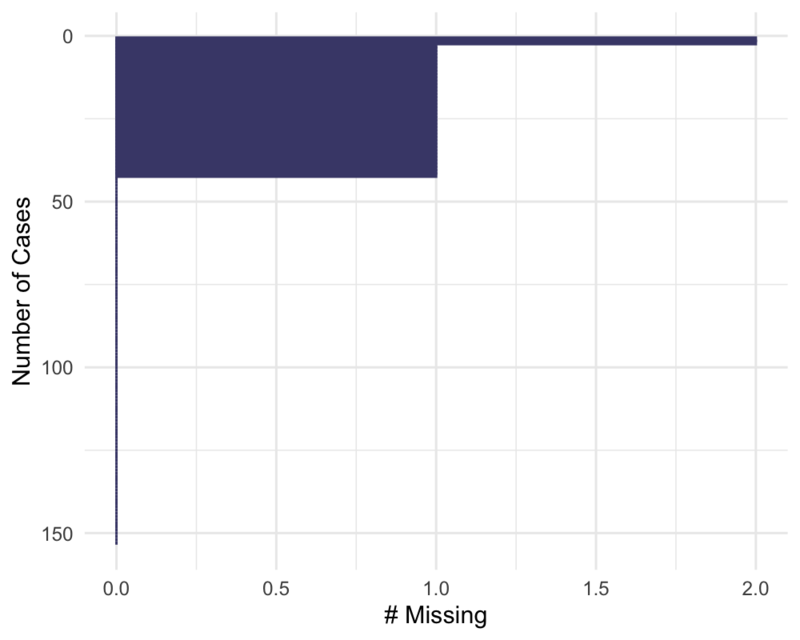 This plot shows the number of missings in each column, broken down by a categorical variable from the dataset. 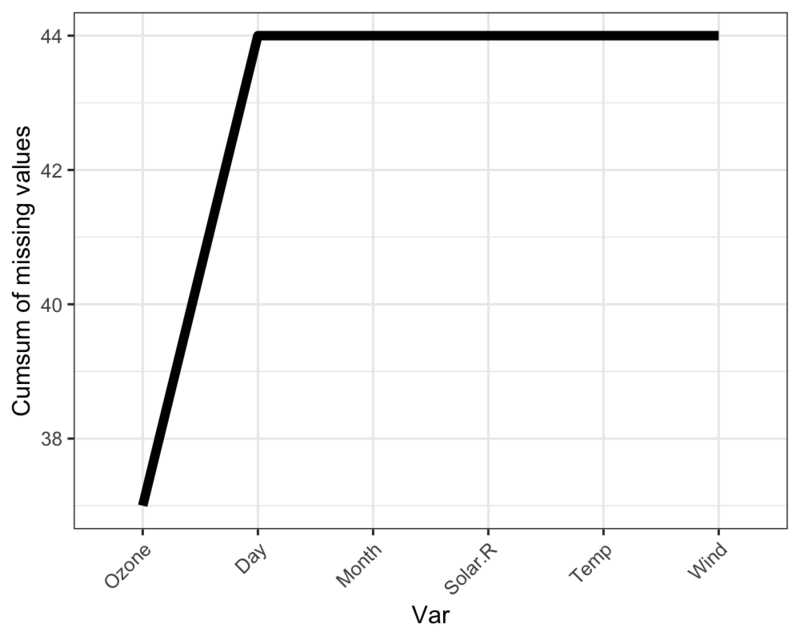 It is powered by a dplyr::group_by statement followed by miss_var_summary(). 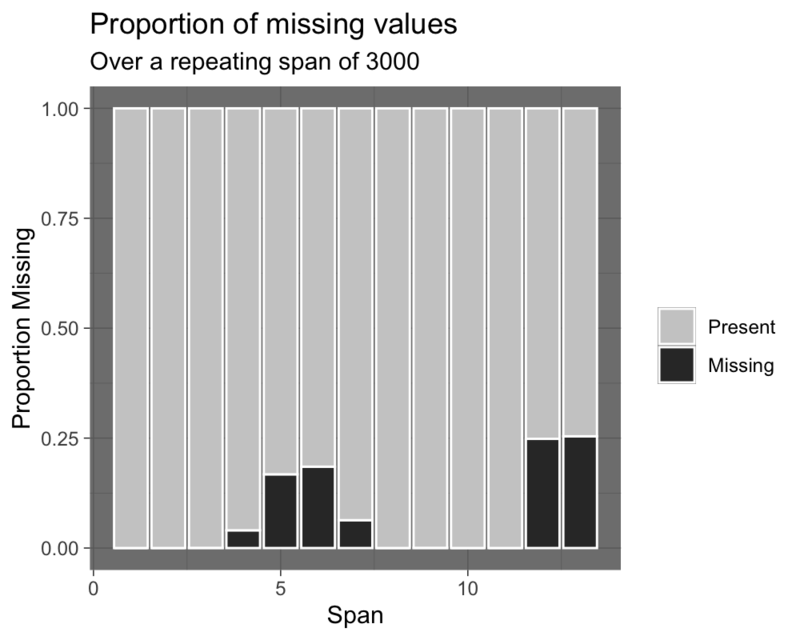 You can also explore miss_var_span by group with the facet argument. 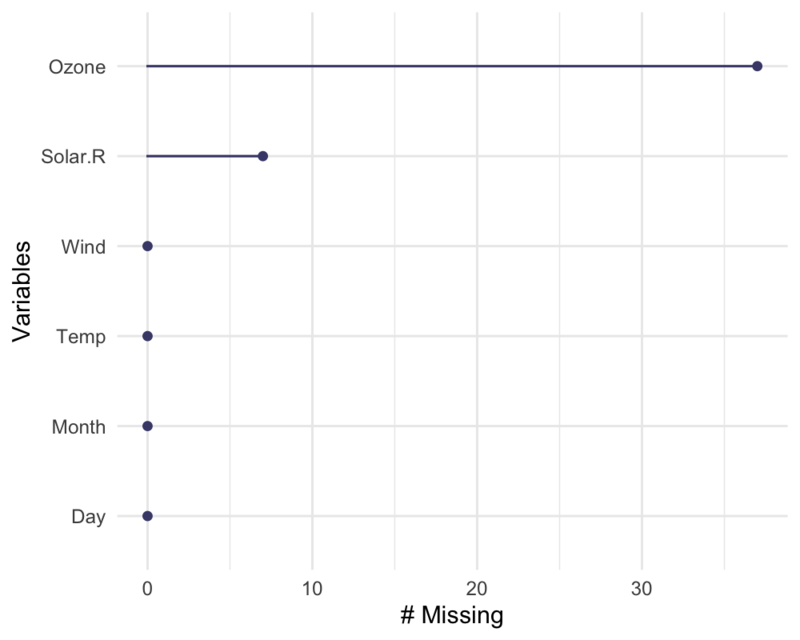 This plot shows the cumulative sum of missing values, reading the rows of the dataset from the top to bottom. It is powered by the miss_case_cumsum() function. 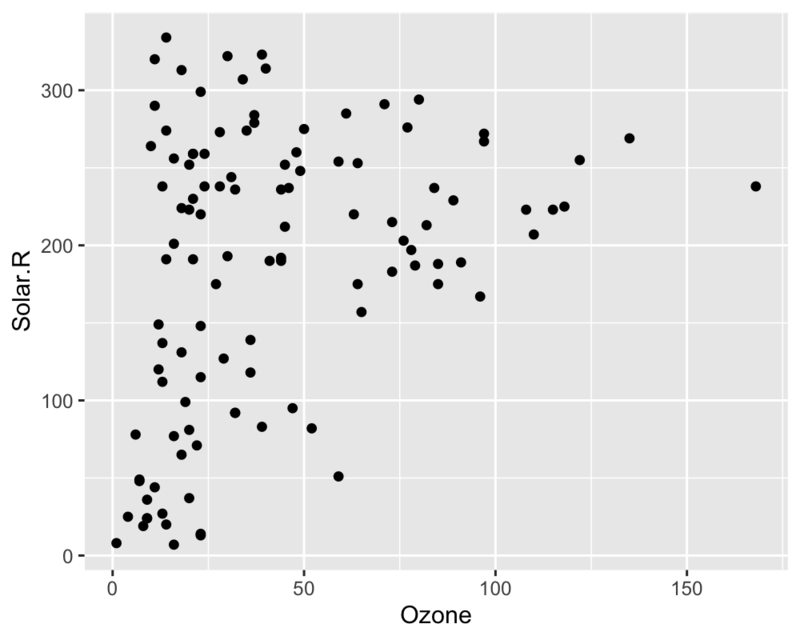 This plot shows the cumulative sum of missing values, reading columns from the left to the right of your dataframe. It is powered by the miss_var_cumsum() function. 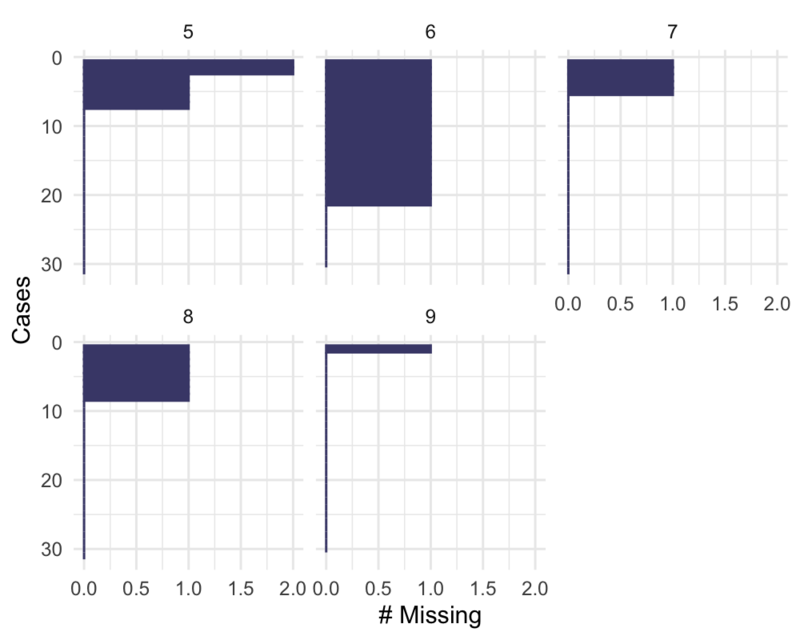 This plot shows a set of rectangles that indicate whether there is a missing element in a column or not.